The design parameters of your application will often dictate your material choice. NW Rapid Mfg. Prints in Polyamide and Polystyrene Materials. 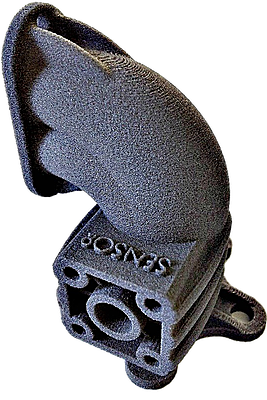 NW Rapid Manufacturing's Selective Laser Sintering systems produce fully functional prototypes and lightweight products of any complexity using polyamide or polystyrene materials. The design parameters of your application will determine the material used. Most of the materials are specialized and/or derivations of nylon. Our standard Nylon 12 material is ideal for most applications. It is lightweight, tough, flexible yet rigid, and economical. Nylon 12 is our choice for prototypes and production parts. Nylon 12 is in compliance with FDA, 21 CFR, §177.1500 9(b) except for alcoholic foodstuff. Nylon 12 has no porosity with wall thicknesses greater than 0.060” (1.5 mm), has exceptional chemical and fuel resistance, and can be used for fuel and liquid storage. We have examples that have held 10psi for longer than three years with no fuel loss. Our Carbon-Fiber/Nylon 12 material provides a superior stiffness factor compared to our high performance Nylon 12. Its high tensile strength makes it perfectly suited for Motorsports applications, Unmanned Aerial Vehicles, Aerospace, and other applications where a high heat tolerance, strength, and resistance to wear are of paramount importance. Gray/Black in color, this material exhibits extreme smoothness when processed with our secondary finishing operations. For the production of cast patterns we utilize a polystyrene material that has a low residual ash, and is easily processed after infiltration with wax. Nearly any metal can be investment cast, but typical materials include A356 Aluminum and Titanium alloys. Our Nylon FR, fire retardant material is ideal for applications where FAR certification is required (meeting FAR 25.853 60 second burn specification) – typical applications would be aircraft, or other commercial transportation interiors, automotive interiors, laboratory ventilation and air handling. Parts will exhibit a smooth surface finish and sharp feature detail. Mechanical properties are similar to our standard Nylon 12. Our Nylon 11 material is used in applications that require slightly higher tensile strength at break along with a higher elongation factor. A true all-weather performer, it excels in extreme climates; it has a high impact resistance at sub-zero temperatures and high pressure resistance. It also possesses a low coefficient of friction. Nylon 11 is not biocompatible. Available in black. Our aluminum flake filled Nylon 12 creates a product characterized by high stiffness and a somewhat metallic (silver color) appearance. This material provides superior dimensional accuracy, good thermal conductivity, easy post processing via machining, grinding, milling. Our secondary polishing processes can provide a surface with a somewhat metallic-looking finish. The aluminum powder creates a product that is somewhat brittle, so this material is not recommended for structural applications. This product should not be used in any application where contact with foodstuffs would be possible. Various finishing options, dyes, paints and inserts are available.